DAXX V53 & V54 Professional Edition coaxial interconnect cable has been developed for audio/video commutations in multimedia system and video control installations. 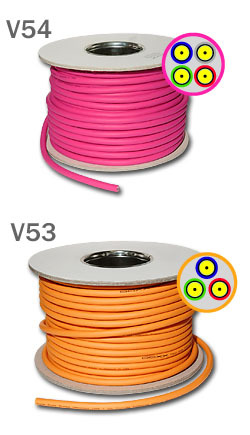 The V53 cable has three coaxial lines covered by common PVC isolator. Each line has double shielded construction made of mylar foil and oxygen-free-copper braided shied protecting the cable from electromagnetic interference, thereby guaranteeing great noise rejection and clear picture. The polyethylene foam dielectric produces low attenuation and provides stable impedance. The outer diameter of the cable is 5.6 mm. The V54 has four coaxial lines inside common PVC isolator. Each live has also double shielde coaxial construction with polyethylene foam dielectric.The outer diameter of V54 is 8.0 mm. The internal geometry of the V53&V54 makes it a perfect choice in wide sphere of applications: composite digital video and audio signal transfer, analog audio and component video.